I was completely stunned by the presidential election results on Tuesday night. Not because I am a fan of Hillary Clinton’s, but because it seemed inconceivable that divisive and dehumanizing messages of fear would be overridden in so many people’s minds in order to follow a “strong man” who would “save” America. Long ago I discerned not to put my faith in the electoral process. Rather, I seek security in God, who in God’s own way and time works through us, even if we cannot see it. God will lead us to where fruit is borne, if we walk humbly, act justly, and love mercy. (Micah 6:8) I have seen evidence of this over the last 35 years: peace accords, freedom movements, recognition of human rights, and amazing accomplishments to eradicate disease, provide clean water, and lift people out of poverty. In this moment, the church is charged to look deeply into its call to offer pastoral, prophetic, and servant leadership. This is a daunting challenge, yet it is incumbent upon us, if we are to be part of the essential truth-telling, healing, embracing the “other”, and eventual reconciling that is before us. I wish it were that simple. However the church, the body of Christ is deeply, deeply divided. There is a gulf of understanding: election results in many rust-belt states show that many Christians there experience loss, alienation, economic exclusion, and disenfranchisement. Sadly, that also describes the experience of many Christians who represent communities of color. Here is a conversation waiting to happen. Lament: People of faith experience their grief. We must cry out to God, “how long?” and share with one another what is on our hearts, even as they may be broken. Parker Palmer suggests that rather than breaking apart, our hearts might be broken open, to allow for a greater capacity for love with compassion that can transform self and others. Repent: We are complicit in the sins of our society. Most significantly, we have failed to heed the experience of our brothers and sisters who have demanded the dismantling of America’s “original sin” of racism. The dislocation that some experience now can only offer a small glimpse into the systemic, brutal and often “legal” denial of humanity that many have been experiencing for decades and generations. In this Kairos moment, we have the opportunity to turn from what grieves God, recognize our own ways of participating in oppression, and commit to working for God’s reign of life with abundance for all. Discern: The word means literally, “to separate the wheat from the chaff.” This is particularly difficult in our consumeristic, individualistic society which tends to value greed and “winners and losers.” Economic forces subject many to a future without much hope for their children. We all want to pay our rent, feed our children, ensure good schools, have a job and save some for retirement. There is common ground amongst most of us. It is worth seeking, beginning in our churches. And let us recall that economic devastation in some parts of the world, some of which is rooted in U.S.-led or sanctioned practices, can lead us not to close our eyes, doors and walls, but to open them with a genuine solidarity that binds our sufferings and our successes together. Act: The goal is to transform reality through reflected-upon action. This begins with loving our neighbors as ourselves. It also means concrete steps to overcome injustice, a willingness to listen to and learn from people who have experienced marginalization themselves and follow their lead, and leading alternative lives to the values of the dominant culture. This may lead people of faith to feel like they are in “exile” but exile-in-community is how the early church began. How is Spirit calling us corporately to act? An inclusive love for all is at the center. From my vantage point, a good time for the church to be alive! Stay connected with this circle of hope. We need your involvement. 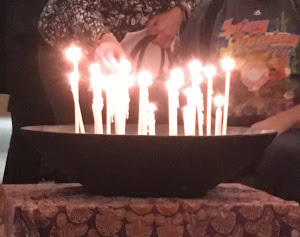 Many faith community events, circles of reflection, and actions will be announced on this website and through our e-news. Your gift keeps this circle connected, joined to find the solutions we cannot forge alone. Thank you for being part of the hope.